The main source of dirt on buildings are silicon oil, exhaust gas, fumes that those oil adhere to the outdoor wall.Those gradually pile up on the oil, that can be hardly removed. Sorbent Oxidative decomposition occurs when light strikes the outer wall or glass surface coated with Solapure (titanium oxide), and the oil that causes dirt decomposes. Then, rainwater wash off the dirt so that you can keep it clean. in other words “the passive principle of nature”. Solapur generates water film, inorganic substance like dust will be flown away. Germ, fungus and virus that harm our health. They always hiding in the room where our family, visitors, and various people gathering. 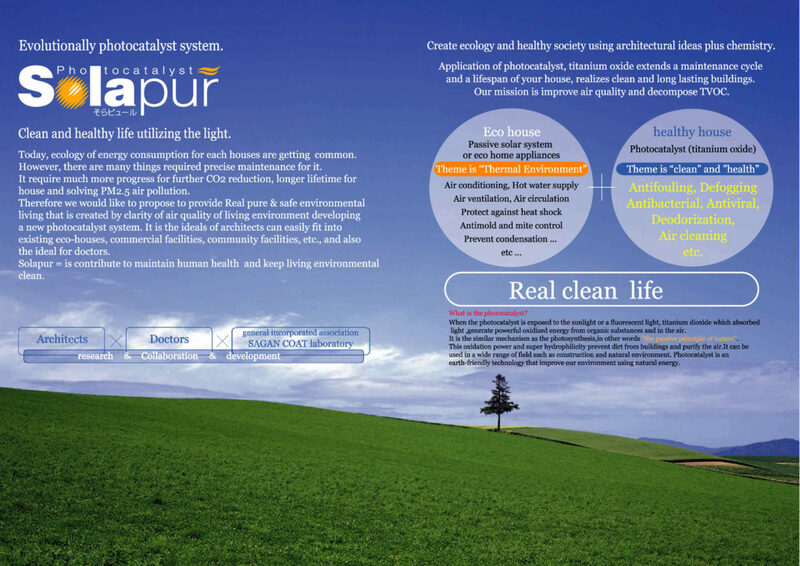 Solapur controls harmful substances using indoor lights, continuously decompose it into harmless water and carbon dioxide. It improves hygienic indoor environment. Furthermore, the photocatalytic effect is also responsive to influenza virus.There is no need for treatment such as chemical spraying or heating,so is expected to be a very effective against influenza. Previous photocatalyst is mainly used in outdoor environment.Solapur offer you even better solutions for indoor use that respond visible light wave. It react to not only LED light but also fluorescent lamp. 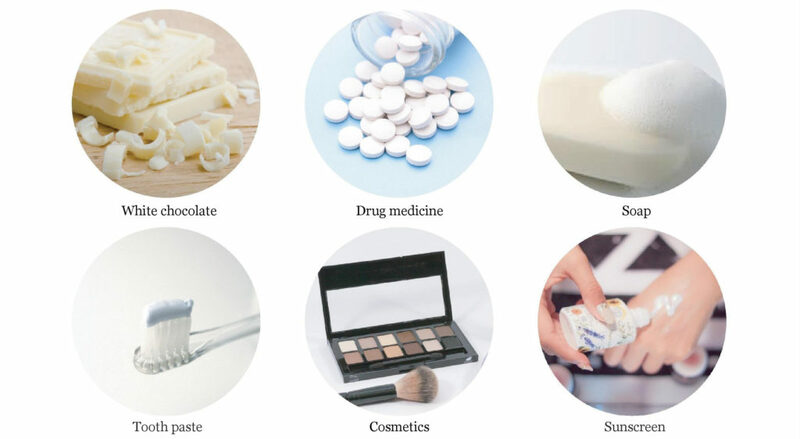 Interior materials, furniture, and daily necessities generates various kinds of chemical substances. Solapur decomposes and removes harmful substances causing ormaldehyde and VOC. It also decomposes and reduce odor. It is effective measures for atopic disease, house dust allergy and sick-house syndrome. Main factor of photochemical smog is a toxic substance in the air, NOx, emitted from factories, buildings and automobiles. Solapur generate super oxide anion which has strong oxidization power to removes air pollutant. It will clean the air around buildings and will contribute to the improve of the global environment. Sunlight and rain keep an outdoor wall clean. No hesitation using White wall design! no need to hesitate choosing white house because Solapur maintain its beauty for up to around 15 years. Whats more is that the air surrounded by the house be purified, easy maintenance and more possible wide range of exterior design ideas and its appearance. Total cost will be reduced! Cleaning and maintenance of the house, especially for a roof and a wall, cost a lot. Constant inspection and maintenance are necessary for us to keep safe and comfortable life, to prevent a house from deterioration and degrading house value. You can see a big cost difference after 50 years if you use Solapur’s self-cleaning function only for exterior walls and windows. LED light power keeps the indoor air and beauty of items clean. Enjoy your natural and healthy life! and VOC is drifting around furniture, cloth, curtain, white appliances. It actually said to be the indoor air is more polluted than the outdoor’s. it shows on effect of air purification and anti-bacteria using only the light. It automatically protects people’s health. are different from the previous products. Solapur contains no organic solvent. →　The coating agent is highly safe. Solapur has a wider response range to visible light than existing photocatalyst products. 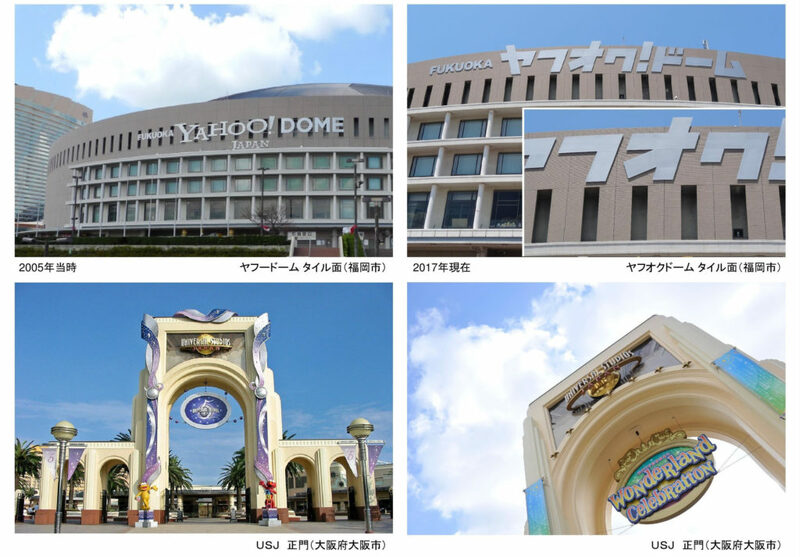 →　High photocatalytic effect in the rooms. Raw material: water type, PH/neutral, long term stable, harmless. Mr. Ichinose Hiromichi, engineering Dr. of Saga Prefecture Ceramics Technology Center, researched and developed as Saga prefecture type. He has verified all of this photocatalysts result that has the top-level effects. 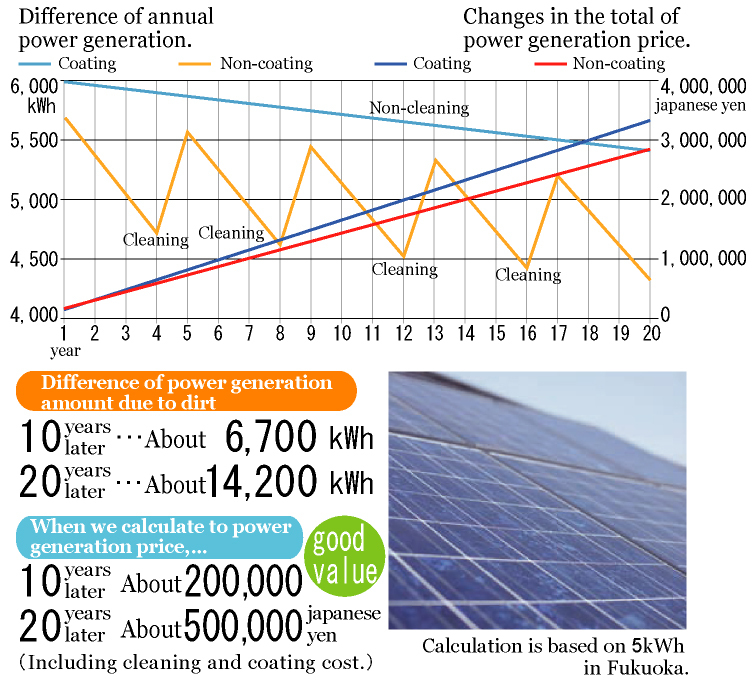 such as solar energy and radiation cooling. “SOYOKAZE” uses solar energy for a heater and a water heater. The system keeps warm up fresh air, thus there is no heat loss. Constantly ventilating air even in winter. Not rely on air conditioners,encounter the nature. Not too hot in summer, and not too cold in winter. The system doesn’t require heating. It is contribute to either economic or environment.It is not only superficial function but a total house construction functional system. The summer under the “SOYOKAZE” system is always cool and warm in winter. Solapur further evolves the ability to capture fresh air. and keeps indoor air fresh and clean all the time. which is recognized as a food additive ,coloring agent. It is extremely stable and highly safe. It is often used as a white pigment since a long time ago. The product received the certificate from the China Interior Decoration Association as an excellent photocatalyst product used for Beijing Olympic facilities. Acquisition the patent of visible light responsive photocatalyst. 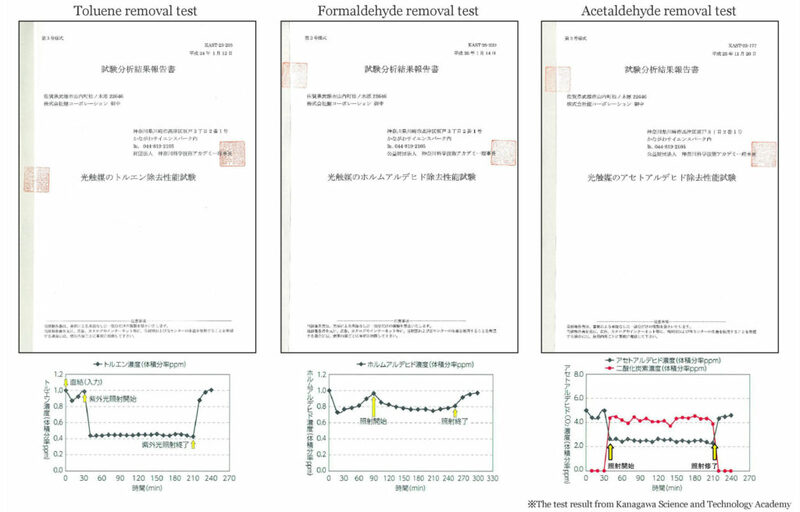 the removal performance is recognized its effect. 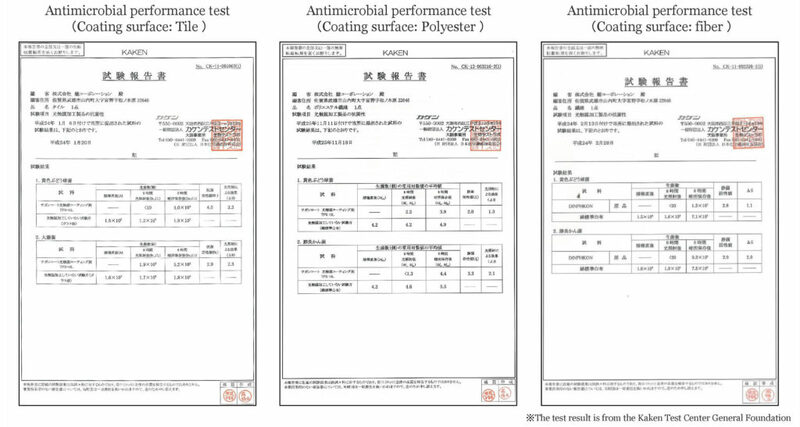 Antimicrobial and antiviral performance is recognized its effect. Titanium oxide is a white powder that is generally used as a color pigment, and also for cosmetics and paper. The soil relatively contains a lot of Titanium atoms around the surface, and no natural resources issues, environmentally friendly. Making fine powder of titanium oxide for photocatalyst, and controlling its crystal form, make it increase the catalytic effect. Titanium oxide needs enough light for effectively developing the catalytic effect, it is the same principle as plant photosynthesis. A raw material, Titanium oxide is a stable substance, and is approved as a food additive. It is widely used for foods and cosmetics. “Solapur”, the coating agent makes a titanium oxide film, is inspected for toxicity, irritation and mutation by The Japan Food Research Laboratory, and they confirmed its safety. Consequently, it can be safely used. Photocatalyst, titanium oxide, provides the function of oxidative decomposition of dirt adhering on the surface of substances and high hydrophilicity when exposed to light. Using these two functions, it provides the effects of anti-fouling, anti-fogging, antibacterial, antiviral, deodorant and air purification. Photocatalyst effect is proportional to the amount of light ,ultraviolet rays, and the area exposed to light. How long the effect last? It depends on the usage and environment. You can keep exterior walls and windows clean, if you repaint it every 15-20 years. Is it effective in indoor rooms? Conventional photocatalyst does not respond to indoor light. Solapur fully shows photocatalytic activity through “Visible light response-type photocatalyst” which responds to even indoor light. Wood has a beautiful grain with scent. The tree develop a beautiful look and colors as time goes by,so we recommend you not to paint, and enjoy the natural beauty of wood. It is good for outdoor woods to use water repellency better than hydrophilicity. We recommend you to use Surfapore W, NanoPhos. Can it be a protection against sick building syndrome? Solapur decomposes toxic organic material, VOC into harmless substances, water and carbon dioxide through photocatalytic reaction. Does it eliminate any odor? In case the cause of odor is an organic compound, it decomposes and eliminate the odor. It basically prevents dirt from antifouling and hydrophilicity but not demonstrating sufficient effect for some dirt from rust, efflorescence, soil, bird droppings, and sap. Does it work for the place where not exposed to direct rain? It has the effect of suppressing the static electricity on the coating surface, so it can be stain resistant, and easy to remove with water. The function of oxidative decomposition varies which depending on intensity of the light, the size of the space, and the type of target to decompose. Hydrophilicity has immediate effect and the product will be effective while exposing to the light. What is the construction like? Use a paint cup gun to apply a coating the photocatalyst “Solapur” for indoors and outdoors. This is the effective item in case of large area coating, and for providing a long effect of photocatalyst. Basically, the coating has to be done by well-trained engineers. For details, please refer to the separate document “Flow (draft)”. 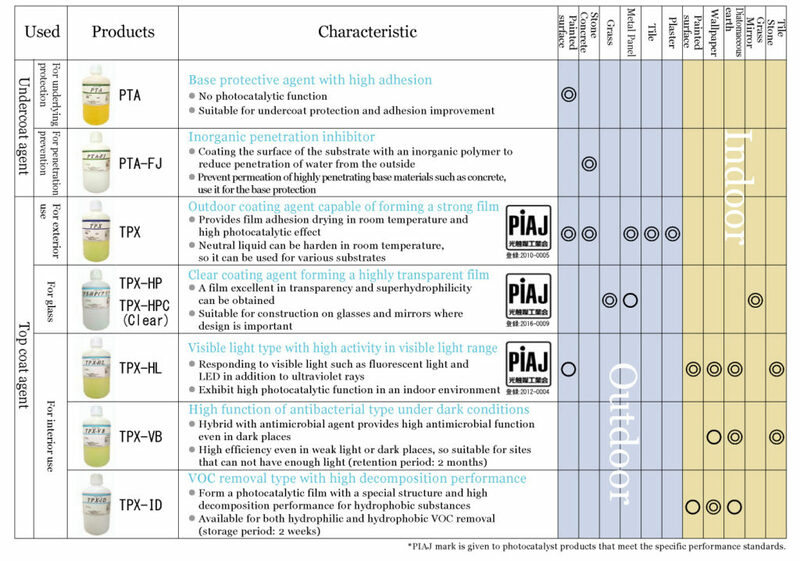 It is a thin film coating, so it does not change appearance. It may have mottled and uneven in some cases when the color of the base material is particularly dark.Dark coloured surface/substrates may change its original colour.For further inquiry, please contact us by email or phone. It depends on the condition of substrate. For details, please contact us by email or phone. Is it possible for us to do the coating construction for our clients by ourselves? It is possible if you conclude the construction agent agreement and have the proper training. We will take responsibility to provide the stock solution. For details, please contact us by email or phone. Is it possible to be a distributor? It is possible if we have entered into a contract to become our distributor. For details, please contact us by email or phone. A cost is different between new houses and existing buildings due to condition of building. Please contact us at for further inquiry. In case of comparing the maintenance cost for exterior walls, the initial cost for Solapur is rather expensive than ordinary exterior paints, but you can reduce the cost for repaint or cleaning due to Solapur’s self-cleaning function. The total cost of maintenance will be totally different after 50 years. For details, please contact us. What’s the difference from other coatings? The stock solution does not contain organic solvents, it only has water and titanium oxide. This means the product is highly safe, easy to coat titanium oxide evenly on surface. As a result, the larger surface area is exposed to the light, it makes the coating film which is good in reaction efficiency. Furthermore, titanium oxide does not decom pose the inorganic film so the solvent does not come off. It shows high sustainability of the effect. For details, please contact us. Especially e xterior walls, windows, indoor walls and ceilings. Also various objects such as painted surface, RC, stone, glass, mirror, metal panel, tile, plaster, diatomaceous earth, wall covering. However, please do not use to tableware, hardware, kimono, cloth leather goods, paper, arts and precious metals. 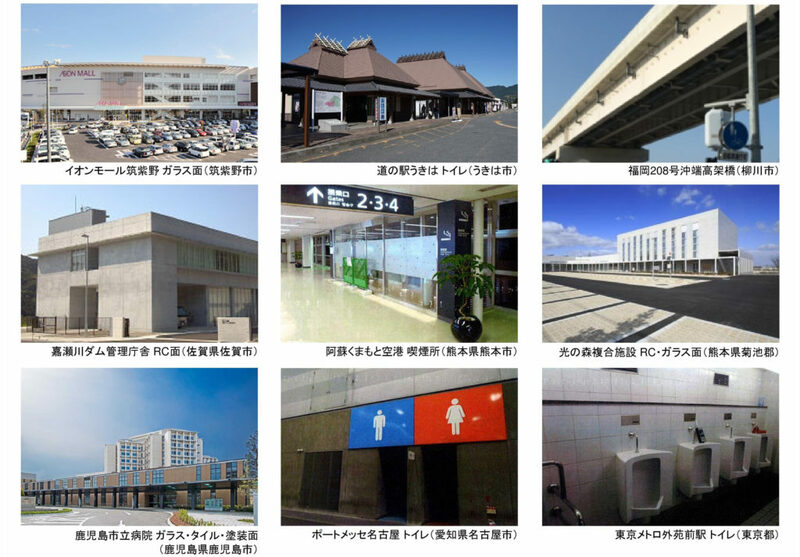 Constructed in various places such as residential houses, public facilities, commercial facilities, educational facilities, medical facilities, etc. For details, please contact us. When is the good timing for the coating? Clean surface before coating. Coating when a new house is built or after house cleaning would be good, you can keep it clean. It is necessary to spray water if it does not rain for a long time or where has less rain. In case many dirt and dust adhere on surface, or dirt accumulates like a smoking place, the product does not work efficiently. In such a case, you need to rinse or wipe off the dirt. It is also necessary to constantly clean ventilators where lots of oil and smoke comes out. Even on cloudy days there is an effect like people sunburn under the cloud. In case there is at least 1 meter gap between buildings, enough ultraviolet rays can be obtained. Does it have an effect on influenza prevention? Solapur decomposes and removes bacteria and virus, so showing an effect on influenza prevention. As a future prospect, we use Solapur for an easily assembled “Clean room”, it is expected to be an effective measure for flu prevention at an entrance of the public place or air ports in winter, the time flu goes around. For details, please contact us. Solapur is available for individual clients. There are other items available, so please do not hesitate to contact us by e-mail or phone. Can we talk to you not only the product but also architectural design? We provide you clean living environment through collaboration between passive solar which provides you comfortable heat environment and photocatalyst provides fresh and safe air to you. Please contact us if you attach importance to air quality. White wall design will be expanded!